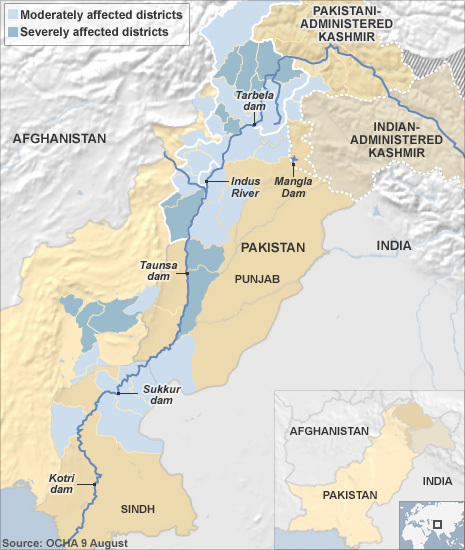 Devastating flooding in Pakistan has destroyed crops and led to a surge in food prices in the country, the United Nations has warned. Some severely hit areas have seen all crops wiped out and many livestock lost, according to the UN's Food and Agriculture Organization (FAO). About 700 000 hectares of crops are under water or destroyed, with many surviving animals without feed. It said the upcoming wheat crop was now at risk. This was "the bread basket" of the country, the group added. "The consequences for the local populations' food security are acute, as food prices have already started to rise sharply," said David Doolan, the FAO's head of programmes in Pakistan. "Over 75% percent of the affected population depends on agriculture for their livelihoods." He added that the organisation's immediate priority was to ensure that surviving livestock did not die. The UN says that It says that so far about 1,600 people have been killed. Elsewhere, food supplies have been severely disrupted in China, pushing up prices where the country is battling with its worst flooding in a decade. At the other extreme, Russia's worst heatwave on record has parched crops. Normally much of the wheat is destined for the global market but now there's an export ban as the country's grain output is cut - with prices having soared by more than 50% since June. However the FAO says that fears of a new global food crisis - similar to that of three years ago - are not justified.